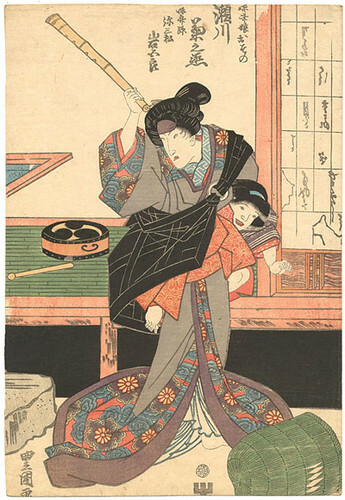 Okay, here's a twister for y'all: A female komuso wielding a shakuhachi with a young girl under her komuso rakusu (miniature okesa, or buddhist robe). 1. There were very few female komuso. So the depiction would either be rare on its face -- or the female is impersonating a male komuso. 2. This is a kabuki female character which means the actor is an onnagata (a 'male actress'). 3. So we have a male playing a female impersonating a male komuso. #1 This role would be soooo much easier if I had Multiple-Personality-Disorder!!! #2 Oh Look....I can see the moon through this thing!!! #3 Spare the shakuhachi....spoil the child. NOT to play wth your father's tengai??!! YOUR TSU-MERIS ARE STILL TOO SHARP!! Wow! Excellent! You have done kabuki-studies too among others....? I know you could read it on the print - but you seem to have knowledge on kabuki plays as well. Actually - it could be really nice to know what people here on the forum are doing... Quite some amazing people here! Why do you always want attention when I'm practicing?? Now get off me and go bother your father!